Zagreb is becoming a bicycle-friendly city. Although we are not quite there yet, Zagreb is evolving. Rent a bike and explore Zagreb in a unique way. More and more people ride a bike every day. Pretty soon Zagreb will become one of the top bicycle-friendly cities as we continue to upgrade our infrastructure. Today, we see an increase in bike tours and bike rental services which have made it easier than ever to experience Zagreb by bike. There are numerous roads to ride, but one of the most popular ones is definitely the Sava embankment which connects the Bundek Park and Jarun Lake. In general, Zagreb is relatively flat. However, the city was divided into the Upper and Lower Town so you can expect some inclines, but nothing you can’t handle. We have bike sharing services, as well as bike rental services. As more and more services evolve we consider exploring Zagreb by bike one of the best Zagreb experiences. 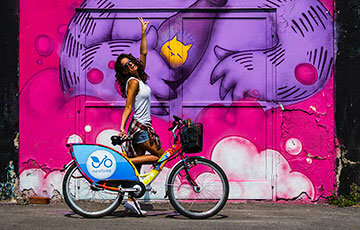 Bike Sharing NextBike Zagreb offers you fast, easy and reliable public bike sharing service. You can rent a bike for 30 minutes or longer at very affordable rates. A great way to explore the city.